The war for Tijuana is not a new war, nor has it ended. 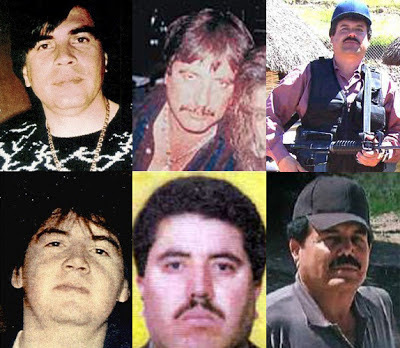 In part 1 of this article we explored the history behind the war for Tijuana, we saw how the Arellano Felix brothers became Mexico´s most powerful cartel in the 90´s, some people didn´t like the article because they thought people like “El Chapo” or “El Mayo” seemed out of league against the Tijuana Cartel, but the truth is, in those days, they didn´t have the power they have now. 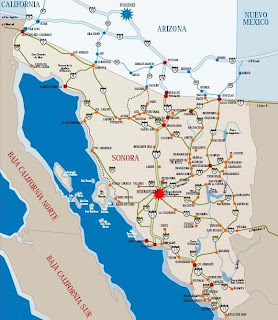 Even if some people don’t like to read this, the fact is the Sinaloa cartel had little to no power in Baja California in the early 90´s, as a matter of fact, the Sinaloa cartel didn´t exist as such, they were all under Amado Carrillo´s orders, be it the Beltran Leyva´s, the Zambada´s, and even Chapo, all of them somehow answered to, or were under protection from Amado Carrillo. Something worth mentioning, is the fact that before all this, Benjamin Arellano was a very good friend of Chapo Guzman, to the point of calling themselves "compadres", but "El Chapo" wasn´t his only "Compadre", according to an interview with Amado Carrillo´s mom, Carrillo was the Godfather of Benjamin´s son. She claimed she had nothing but respect for the Arellano Felix family, who promised to respect Amado´s family and their property. The following are some of the most important facts in the war for Tijuana, some of them didn´t take place in Tijuana, but they surely had an effect on the war for the city. 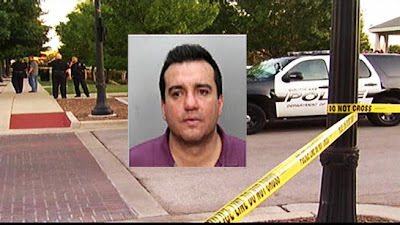 Juan Guerrero Chapa, 43, was gunned down at about 7 p.m. May 22 at the Southlake Town Square by a masked man who jumped out of the back seat of a white sport utility vehicle, police said. Chapa had worked for the Department of Homeland Security Investigations, secretly providing inside information on cartel operations to American investigators. The Mexican drug cartel attorney who was slain execution-style in Southlake last week had been a confidential informant for the U.S. government, law enforcement sources told NBC 5. Juan Guerrero Chapa, 43, had worked for the Department of Homeland Security Investigations, secretly providing inside information on cartel operations to American investigators. HSI is part of U.S. Immigration and Customs Enforcement. Guerrero was gunned down at about 7 p.m. May 22 at the Southlake Town Square by a masked man who jumped out of the back seat of a white sport utility vehicle, police said. It was the first homicide in the upscale suburb since 1999. 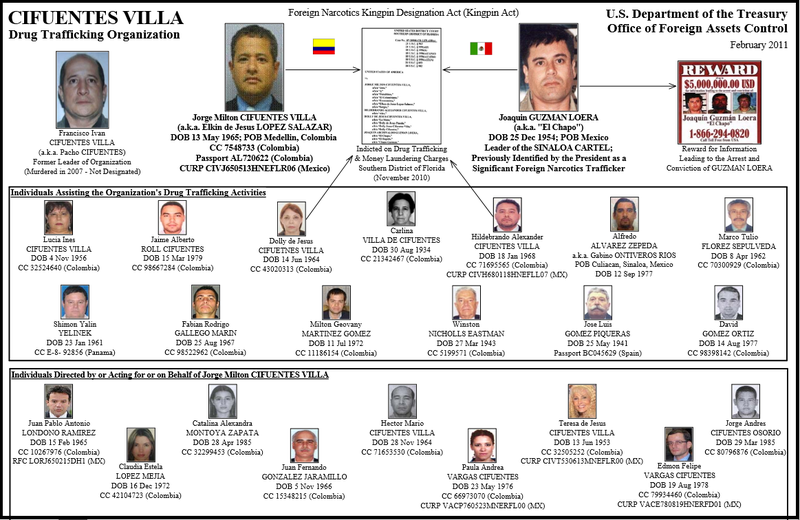 The attorney had worked for top leaders of the Gulf Cartel, including former top boss Osiel Cardenas, who is now in prison in the United States. It was unclear if his role as an informant may have leaked to the cartel, providing a motive for his killing. At least two U.S. trials of high-ranking Gulf Cartel members have concluded in recent weeks. Guerrero, a Mexican citizen, his wife and three teenage children had been living in Southlake for two years, police said. They had been living in the U.S. legally, according to ICE spokesman Carl Rusnock. High-level informants from Mexico or other countries are sometimes allowed to live in the United States as long as they are cooperating. Rusnock had no comment when asked about Guerrero’s role as an informant. He referred questions to Southlake police. Southlake police spokeswoman Kim Leach also declined comment. Along with the FBI and the Drug Enforcement Administration, HSI investigates drug crimes. With 6,700 special agents, HSI is the second-largest federal law enforcement agency. Only the FBI is bigger. A decade before he became one of the three leaders of the powerful Gulf Cartel in Mexico, Antonio Ezequiel Cardenas Guillen slipped away from U.S. investigators in Houston, according to an FBI file released through an open records request. By the late 2000s, Cardenas, whose brother Osiel preceded him as the cartel’s leader and started the Zetas gang, was a member of a triumvirate that ran the cartel, according to an indictment filed in a Washington, D.C., federal court. 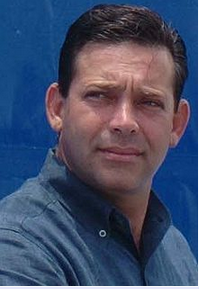 In November 2011, Antonio Cardenas, known as “Tony Tormenta” was killed in a shootout with Mexican marines in the border city of Matamoros. According to the reports in the FBI files, investigators didn’t know much about Cardenas or the organization with which he was working. Agents circulated information about him and his vehicle, but by then he had escaped. In a memo filed in December 1999, an FBI agent said Harris County prosecutors had indicted Cardenas on drug charges and wrote that the bureau would be closing its file. Only a month earlier, the Cardenas name began to ring out along the Texas-Mexico border when Osiel and his henchmen forced a pair of U.S. agents off the road in Matamoros and threatened to kill them. 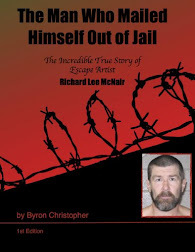 The agents talked their way out and rescued the informant who had been showing them around the Gulf Cartel stronghold. Osiel Cardenas was eventually arrested in Mexico in 2004 and extradited to the U.S. in 2007. In 2010, he was sentenced to 25 years in prison. He was most famous for hiring as his personal muscle the band of former Mexican special forces soldiers who would become the Zetas. After Cardenas’s extradition, leadership of the cartel fell to a committee of Tony Tormenta, Eduardo “El Coss” Costilla Sanchez, a capo under Osiel Cardenas, and Zetas leader Heriberto Lazcano, who was killed last year. 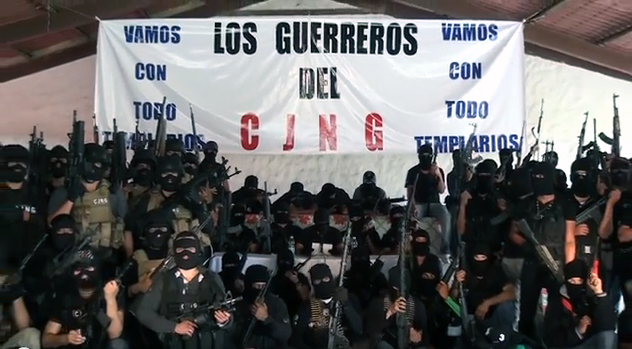 The New Generation Jalisco Cartel (CJNG) transmits this communication to the society of Guerrero and Michoacán so you all know the purpose of this war is against the filthy Knights Templar. As in the previous statements several people have asked why this war, this warfare is not against society, so dont be alarmed, this war is against those individuals. Many people are tired of so many injustices committed by these rats that engaged in kidnapping and extortion. Tuta... you say in your speech that the group of rats you command like el chayo, el kiki Plancarte; they are not narco traffickers, but also they are not a cartel and that they are not part of organized crime and that's clear, because a narco trafficker does not engaged in stealing land or charge fees to all the people who work, yet you charge the aguacateros(Avacado dealers) a peso for every kilo of the mouth that packs it, who transports it, the taxi drivers, bus drivers, entrepreneurs, grocery stores, and even the lemon dealers you charge them a quota. Don't you see the consequences, they have killed innocent people to steal their land, their gardens and livestock. people are tired of so many of these injustices, they don't speak up because of fear, but we, who are originally from Guerrero and Michoacán, we are witnesses of these atrocities, made by you, the Knights Templar. We warriors of Jalisco New Generation cartel are fighting for this cause not to govern but for Michoacán and Guerrero and to put an end by killing all these evils, so we have peace and tranquility in these states. We can then regain our homes, our land and our livestock; we avenge our families. To all the innocent people who have been unjustly killed and robbed, we are the a proud cartel, The New Generation Jalisco Cartel (CJNG). We don't dedicate our time to kidnapping or extorting, this is why you, Mr. President Enrique Peña Nieto and the governor of Guerrero, Aguirre Agel Rivero, with all due respect, we ask to let us do our job, to end with these scourges and after we finish with these evils and finish our work, you can then act according to law against us because we are drug dealers and belong to a cartel but we do not accept nor will we tolerate these injustices by the Knights Templar. To all those who work with the Knights Templar prepare yourselves for the consequences, we know that the local police chief of the union of Guerrero. 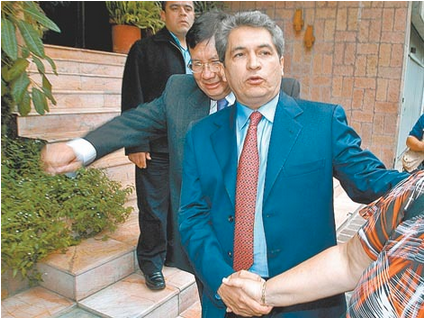 Jaime Suástegui receives a monthly payroll of 120 thousand pesos for you and your officers by the Knights Templar. All municipal police in Michoacán receives a payroll according to El Aria. So I ask Marina Captain Ivan Garcia Alvarez to let us work because we know who works with the Knights Templar. We also ask the lieutenants; Seiana Espinosa Cortes, Fernando Alvarado Betancourt and sergeant of the 2nd infantry of Guerrero, Oliver Vargas not to intervene and let us to continue the work in cleaning Guerrero and Michoacán for the good of society and our families. We are going in with everything, going for you 'pear makers in Zihuatanejo and Ixtapa plan for you Chano Riola, for Beto Bravo aka the hawk, for the boss of the plaza in Zihuatanejo Juan Magaña, Adrián Reyes cárdenas alias El Tigre. Also for you Canelo, El Cachete, El Arcángel, El Vico, El Mando, El Wigan, Felipe and Edgar Gutierrez aka 'the golden boy.' And those who are in charge of Petatlán, for El Alfa and La Comadre who are boss of El Gavilan. You aren't going to fight solely with El Puma anymore but also with us bastards. 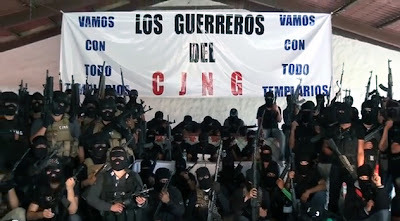 The New Generation Jalisco Cartel; you're now going to know what a war is and we ask the public prosecutor of Zihuatanejo and Petatlán to simply do your job and don't tangle with the Knights Templar because we agree with the ideals of Señor Lucio Cabañas Barrientos that many years ago he fought for the injustices of Guerrero and that is why we ask our comrades who are in San luis la loma, Coahuayutla, Etatlán, La Union, Feliciano, La Salada, Coyuquilla, Petacalco and Las tama. All the villages dont lower your guard and hit them with everything you got because the victory is ours. Knights Templar don't worry about looking for us because we will find you, we are ready. The Warriors Jalisco Cartel New Generation. 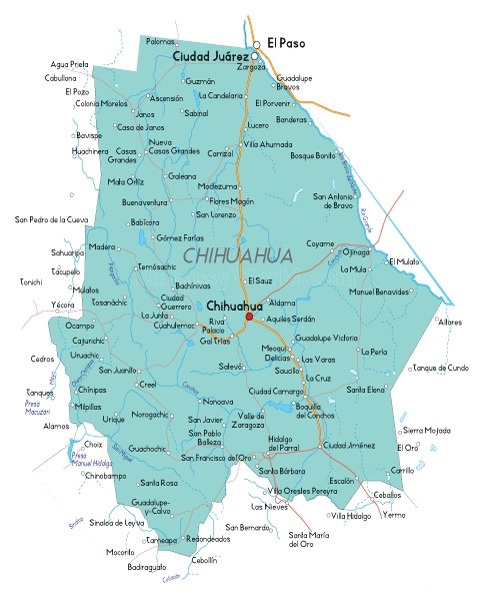 A total of six individuals were killed in three separate incidents in far southern Chihuahua state, according to Mexican news accounts. A news report which appeared on the website of La Polaka news daily said that one municipal police agent and two others were killed Wednesday in separate incidents in Parral municipality. An unidentified municipal police agent was shot to death early Wednesday morning in Parral. According to the La Polaka report, the agent was shot in front of his family presumably at his residence on Calle Cerro Los Azules in La Muela colony. Later that day a running gunfight developed which occurred over a number of areas in Parral, specifically in Fatima colony, where dozens of residences were hit by gunfire and expended cartridge casing were scattered about. Since the description doesn't make references to local police, it is possible the firefight was between rival gangs in the area. Two unidentified individuals were immolated when the vehicle they were in caught fire. Armed suspects attacked the vehicle with a hand grenade on Calle Plata near a Seguro store. The reports are unclear if a hand grenade caused the fire or if gunfire caused it. According to another news account posted on the online edition of El Sol de Parral, three men were found immolated in Ciudad Jimenez, which is about 51 kilometers east of Parral. David Bueno Pasillas, 42, and Jesus Eduardo Guillen Anaya. All three victims were from Ciudad Jimenez. At around 2330 hrs Monday evening police were called to a location on the road between Parral and Jimenez, where a Ford Lobo pickup truck was reported afire. A total of five 9mm spent shell casings were found near the site of the vehicle fire. A total of six individuals were killed in drug or gang related violence in and around Monterrey, Nuevo Leon since last Saturday, according to Mexican news reports. According to a news account posted on the website of Milenio news daily, four members of a criminal cell were killed by Nuevo Leon state police agents Wednesday. 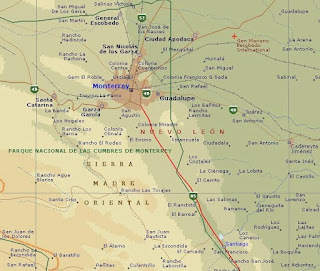 Several days ago, Mexican security authorities detained an undisclosed number of women in Marin municipality, who told police of the existence of a number of areas in and around Marin which were used by a local criminal gang as training areas. A search was undertaken in the area, so when a group of Agencia Estatal de Investigaciones (AEI) agents went into an area with a number of abandoned residences on Nuevo Leon Highway 5, they came under small arms from an armed group which was holed up inside one of the residences. Police returned fire initiating a firefight which lasted several minutes. 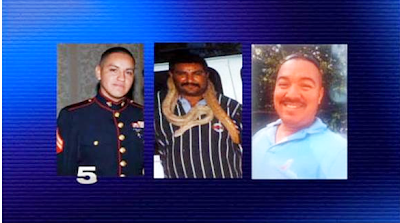 Agents then found four armed suspects who died in the confrontations. 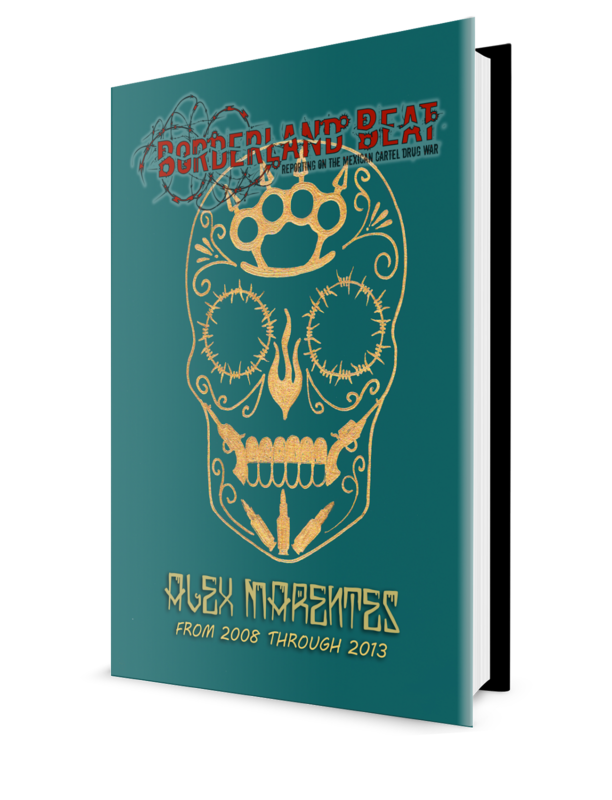 Among the dead was an man identified only as El Chino Marino, who was said in news reports to be a local leader of a gang affiliated with Los Zetas. Three AEI agents were hit with shrapnel in the firefight but were not wounded seriously. In the aftermath police secured one vehicle, four rifles, an undisclosed number of pistols, ammunition and drugs. A separate Milenio report said that two of the four dead were identified as Cristopher Martinez Nava, 17, and Jesus Alberto Sandoval Rocha, 21. Three other individuals were killed in three separate incidents, including two women. Three days ago, a failed home invasion robbery led to the death of one unidentified armed suspect in northern Monterrey. According to a news report posted on the online edition of Milenio, at around midnight, two suspects forced their way into a residence located near the intersection of calles Castillejo and Militronche in Barrio Chapultepec Norte. colony, but were met instead with an unidentified AEI agent with a 9mm semiautomatic pistol. One of the suspects managed to flee while the other was struck by gunfire and died at the scene. Apparently, the armed suspects entered the residence to extort the owner of an internet cafe, not realizing oneof the owners was a Nuevo Leon AEI agent. An unidentified woman was found buried secretly at a cemetery in Anahuac municipality in far northern Nuevo Leon state Wednesday. According to a news report posed on the website of Milenio, municipal police agents found the grave, which has only recently been dug at the site. The victim had been beaten to death. The news report did not speculate as to the victim's age, only that she was described as young. In San Nicolas de los Garza municipality, another young woman was found shot to death. Myriam Alejandra Lara Padilla, 24, was found in Pedregal de Santo Domingo colony struck by gunfire six times Wednesday. The report said she has been shot by armed suspects from aboard a vehicle. Separately, a man was detained by AEI agents in Monterrey Wednesday and 59 kilograms of marijuana were seized. The arrest took place on Avenida Lincoln in Fidel Velazquez colony where Hector José Ortega Perez, 63, was stopped as he was driving a Silverado pickup truck. The drugs had been hidden beneath a cargo of fruit. Ortega Perez was allegedly involved in the distribution of marijuana since eight months ago, according to the news account. 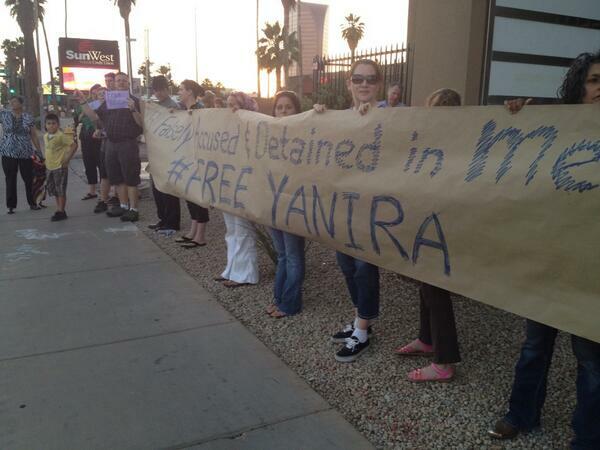 Yanira Maldonado was released late Thursday. 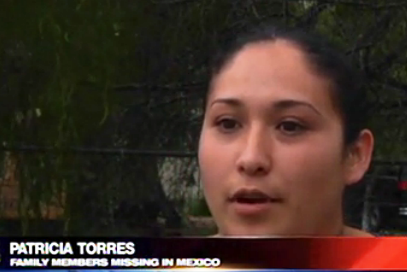 Her husband Gary drove to Nogales to pick up his wife. 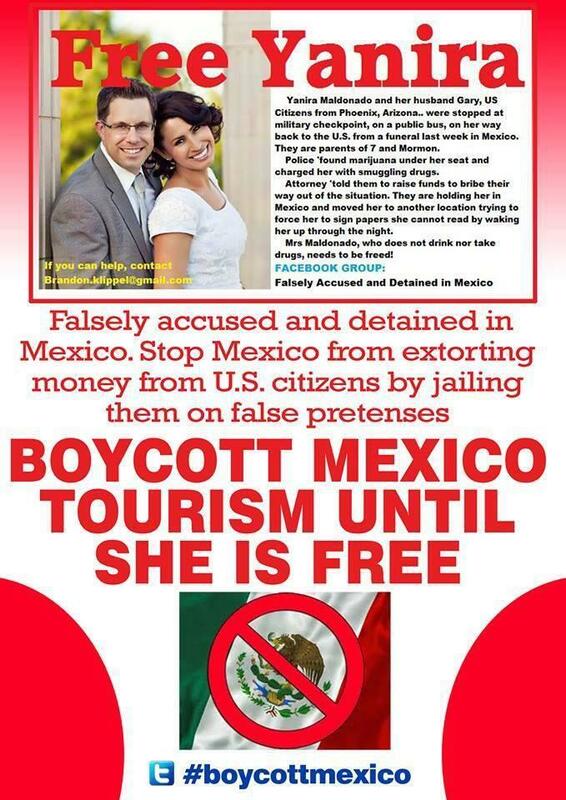 "I always told people, go to Mexico, it is not true what they are saying"
The husband of Yanira stated in a video interview he is confident the charges will be dropped after court officials reviewed video Thursday that showed the couple boarding a bus with only blankets and bottles of water. This is exactly what Yanira hoped authorities would do, to review the video footage that she maintained would prove her innocence. Gary Maldonado said the video should exonerate he and his wife, and end the nightmare scenario that has prompted outrage in the U.S. among politicians and resulted in the Arizona family, fighting against a judicial system that is permeated with corruption. "It showed exactly what I hoped it would show, what we brought on this bus," Gary Maldonado said after the court hearing Thursday. "The nightmare is not over yet, but having this evidence here, that was key to get that evidence, the witnesses, and the bus video to prove she is innocent." The incident has sparked a movement in Arizona calling for a travel to Mexico boycott, I understand emotions are high, and I have supported Yanira's innocence from the start, it simply smacked of a set up. However, I can't support a boycott asking an entire nation of people to join a boycott that affects another nation in a knee jerk reaction because of one wrongly accused US citizen. That will result in zero productivity. It is a sad point of reality that the Phoenix protestors couldn't have been moved to action from the many tragedies occurring in Mexico, to Mexicans, migrants and 3 members of a Texas family, one a Marine who served the United States nation proudly. 6 million Americans visit Mexico each year, 1 million plus Americans live in Mexico, each year there are an average of 100-130 murders of Americans. The murders are quantified in a catch all category which does not define if a murder is a crime of passion versus narco violence, but that is about 2.1 per 100k capita. As an comparitive, lets take Orlando Florida, the home of Disney World and many other famous tourist destinations. Orlando has a rate 7.5 homicides per 100k. Be proactive, discover yourself how Houston, Stl, Chicago, Washington DC and other tourist cities stack up with places in Mexico such as Cabo, Cancun, and Puerto Vallarta. Blanket statements are irresponsible, and clearly I am not contending that Mexico is without concerns, and make that major concerns in some areas, but even the state department travel warning list includes a small portion of Mexico on the list. Be informed, check updated info and as anyplace one may travel, Hong Kong, Mexico City, or Orlando Florida, educated yourself before travelling. In a tearful television interview with CNN, from the Nogales, Sonora prison she is presently incarcerated in, a distraught Yanira Maldonado unequivocally declared her innocence of the drug charges pending against her. She explained that she and her husband were returning to Arizona when federal agents stopped the bus and ordered everyone off. Almost immediately they singled out Maldonado and her husband for interrogation, which resulted in her arrest under the suspicion of drug trafficking 12 pounds of marijuana supposedly stashed under her seat. Maldonado says the investigation has not advanced and she pointed out that there are security cameras in the terminal that would prove her innocence, however Mexican authorities have not viewed the footage. She stressed that fingerprint analysis also has not been conducted that would also prove her innocence. There will be a hearing tomorrow to determine if the mother will be charged or set free. 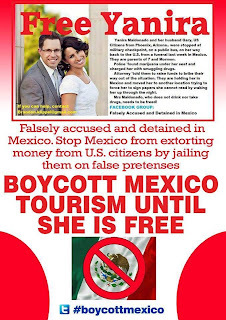 The mother of seven children stated that she has always defended travel to Mexico, something she and her family does once a year to visit family in Sonora, "I always told people, go to Mexico, it is not true what they are saying". The family of a Mormon mother from Arizona imprisoned in Mexico for the past week says she is innocent after Mexican military personnel found 12 pounds of marijuana hidden under her bus seat while she and her husband were returning to the Phoenix area from a funeral in Mexico. Family members believe that someone else may have been trying to smuggle the marijuana and that Yanira Maldonado just happened to be sitting in the seat where the drugs were hidden. 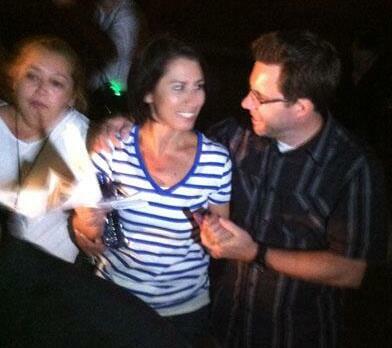 "We feel we have a strong case," said Larry Maldonado, Yanira's father-in-law. Yanira, from Goodyear, Ariz., was returning to the Valley with her husband, Gary Maldonado, on May 22, when they passed through a military checkpoint near Hermosillo, Mexico, and the drugs were found. She has been trying to prove her innocence ever since. She is being held in a prison in Nogales, Sonora, Larry Maldonado said. 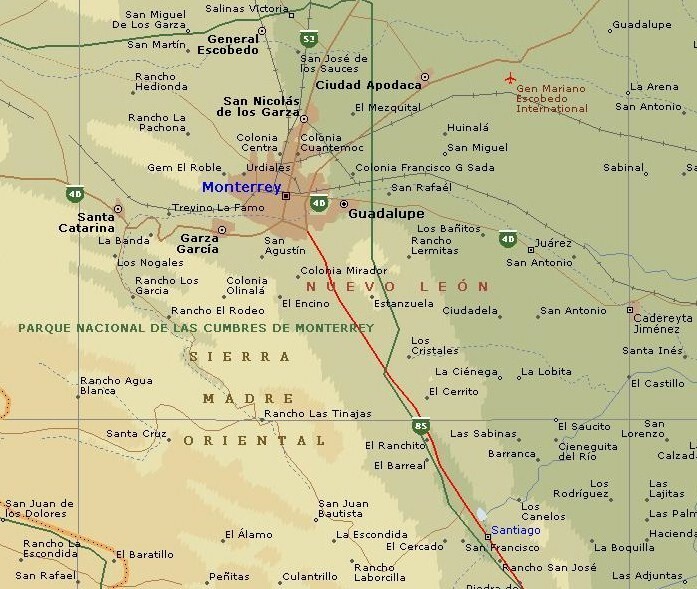 Three unidentified individuals were found dead or were killed in drug and gang related violence in Zacatecas state, according to Mexican news accounts, and BorderlandBeat anonymous correspondent, Zac. "Shootouts and executions continue, near Fresnillo more human remains were found and it's in that city where shootouts have been more common," writes Zac. According to a news account posted on the website of ZTR Zacatecas news daily, the remains of at least one unidentified individual was found near Fresnillo municipality near the village of El Triunfo. According to the report, an unidentified individual stumbled on the location Sunday nine days ago while searching for firewood in the sierras where he saw bone fragments, some human tissue, and some trash, including soda and beer bottles and some clothing. The Mexican Army had been notified and arrived at the location six days ago. According to a translated quote referring to December, 2012, in the story by an unidentified resident, ""There was a chance that 19 federal police patrols along with the helicopter, made a persecution against such evil people, which took the life of 12 gunmen," said one resident. It is unclear which gunfight the resident was referring to since a number of raids and gunfights between Mexican security forces and armed suspects took place during the month of December, 2012 throughout the state including in Fresnillo and Guadalupe municipalities. About the current situation in Fresnillo and Guadalupe municipalities, Zac writes: "Perhaps the most alarming things around the capital have been 1 execution attempt and a brief shootout in plain daylight in busy areas, but... ...it's more of a constant dripping of violence than big bursts of it, minor shootouts are still a daily thing, usually in colonias in the outskirts. " According a news report which appeared in the online edition of Hoy Zacatecas news daily, five days ago a business owner, Francisco Montes Tijerin, 75, was shot and wounded outside his business on Avenida Francisco García Salinas near the Centro Comercial Tahon commercial center. More than two weeks ago an unidentified man was shot and wounded in an intergang gunfight on Bulevar José Lopez Portillo, and an unidentified woman was hurt incident to the shootout when she was hit by a vehicle, according to a separate report in Hoy Zacatecas. Some of the armed suspects involved in the shootout fled the scene aboard a Ford Lobo pickup truck. According to Zac, two men were executed in Transcoso municipality Monday. "Last night 2 men were killed in Trancoso, it was a weird night with the football match, rumors of shootings here and there, people celebrating and all that, so it´s not clear what happened and which rumors are true, federal police closed down part of the city center, people who were watching the game at bars in the area were not allowed to leave for a while, but one news site says it was a false alarm and others don't mention anything...I have my doubts about the false alarm thing, but as you can imagine it was a noisy and moved night so it´s hard to know what exactly happened," writes Zac. According to news report posted on the website of Zacatecas en Linea news daily, two men identified as Juan Carlos Saucedo and Juan Carlos Cordero Tenorio, were found shot to death on a dirt road next to a mall. A third individual, identified as Juan Carlos Garcia Cordero, 41, was briefly detained a short distance away by local Policia Metropolitana. He was subsequently escorted for medical attention by Policia Federal and Policia Investigadora police units. According to a report the two victims were shot with small caliber weapons, .22 or .25 caliber, and since no spent shell casings were reported at the scene, the weapon used could have been a revolver. Cartel affiliated gangs typically prefer to use 5.7mm, Super .38 or 9mm pistols in their enforcement activities. "He didn't participate in executions or anything like that...."
El Pitufo (The Smurf) is the code name for the protected witness whose testimony was used in order to arrest of the former governor of Tamaulipas, Tomas Yarrington. The Smurf said he doesn't regret being part of organized crime, because he did not kill anyone, just trafficked drugs and money."... I did not participate in executions or in anything like that, If you do understand me, my (part) was logistics, money," he said. 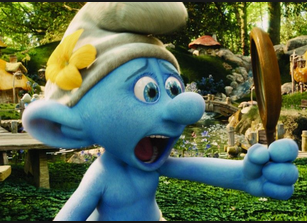 The Smurf sought Milenio in order to comment and complains much of what appears in the media does not correspond to reality, because they have tried to relate the information in various investigations as in the generales or Greg Sanchez whose investigations were led by the Attorney General of the Republic. Today he claims to have an honest job and lives with the protection granted by the Mexican government. However, he doesn't forget that years ago he introduced into to the country as much as "24 tons of cocaine" from Panama. This operation went through ports of either Veracruz or Altamira in Tamaulipas, or by road from Tabasco. He explained that he worked three years for drug trafficker Gilberto Garcia Mena, El June, and five others for Osiel Cardenas Guillen and the late Heriberto Lazcano Lazcano, El Lazca. 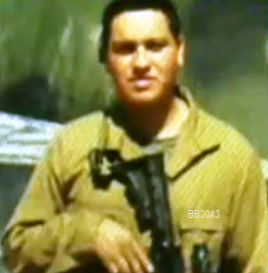 In 2008, federal authorities found him in the Barrientos jail in Tlalnepantla, State of Mexico, and he decided to become a protected witness for the following reason:"It was very ugly war between the Gulf and its armed wing Los Zetas against Sinaloa cartel), (at the time) I was in charge of operating in the State of Mexico" when Los Zetas made a deal with the Beltran Leyva cartel. And the other reason: because the current leader of Los Zetas, Miguel Angel Trevino Morales, El Z-40, ordered to kill him. "Z-40, began to bring (cocaine) on his own and since I was in charge of Panama, then you realize and notice he was beginning to cause problems, so that lazcano wouldn't be notified"
When asked why he testified against Tomas Yarrington, The Smurf replied that he knows many facts. "The governor in charge after him?" -Eugenio Hernández gave us the entire state, let us do whatever we wanted, we appointed the secretaries of security for them, everything we did. They got me, he invited me, we worked in the same area, under orders of Alberto Gonzalez Chalate. Asked what the PGR offered for joining the witness protection program, he replied: "Nothing, nothing more than just security." - Do you have security (body guards)? How long will you have them? -Well, right now, but with the changes, who knows, because they don't inform or say anything, but you see many things come out, who knows what will happen? -Really tell me you regretted being part of the organization? -You don't regret your involvement? -No, why would I tell you a lie, that is, yes, it is wrong, I understand, but no I don't. No, I don't. You don't have to run around in all directions all the time. .- How did you meet him? - With whom Tomas interviewed ? There were Jorge Eduardo Costilla. El Coss, Lazcano, Z-3 El Paisa, El Cachetes, Tormenta..
- Who else?-Ali, La Conga. - And how were you treated? Well imagine, I belonged to the people of Lazcano, Tomas was closer with Osiel's people, it was then when we became closer because it was when they detained Osiel and Lazcano's people (Los Zetas) began to be in charge of everything, That is when it grew from just being a group, (one of the many ones that had Osiel had) into an even bigger group than the whole cartel. The following is a comment sent in from a reader who personally acquainted with the former marine and was the marine's former employer. If you feel compelled to encourage the US government to seek answers for the family use the links below. It is difficult to get cooperation from Mexico, however, if citizens apply pressure perhaps it will motivate officials to seek information for the family. "This Marine worked for me for 3 yrs. He served his country honorable and is an Iraqi veteran. He moved down by the border with his kids and just recently left the reserves in Galveston. He went to visit his father that he had not seen in a while. If you would like to help please contact the following to apply pressure on in the right places." This former Marine and his family need support Texas/Mexico. When is enough, enough? When they finally come for you??? What then? Who will save your life? "Aun quedamos los mejores y los mas preparados, los zetas seguimos presentes." "We, the best and better prepared are still here, We Los zetas remain present"
Oaxaca, Oax.- Alberto Lopez Bello and Jacobo Robles, reporters of police section of the newspaper “El Imparcial” of Oaxaca, were arrested at dusk of this Saturday when they were photographing a banner placed allegedly by members of the organized crime on the pedestrian bridge of the municipality of San Antonio de la Cal, over the federal highway 175 Oaxaca – Puerto Escondido. The reasoning of the uniform men, officers of the State Police (PE) leaded by secretary of branch, Marco Tulio Lopez Escamilla, was that the journalists had been the first to arrive to the scene and that is why they surrounded them. Despite that the journalists identified themselves as workers of the aforementioned newspaper, the police officers detained, then forcedly transferred them to the headquarters of the State Police, located on the nearby municipality of Santa Maria Coyotepec. They confiscated their photography equipment, cell phones and their motorcycles; besides, they were processed and mugshot photographed front and sideways for the formation of a file; which means that they were “put on criminal record” as if they were delinquent. Later, the reporters of the newspaper “El Imparcial” were send to the office of the Attorney General of the Republic (PGR), where later were released. 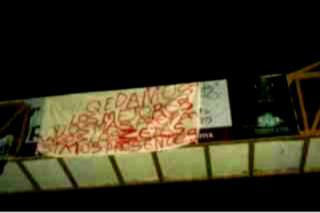 Alberto Lopez Bello, reporter of police news and Robles, photographer/reporter, announced that in the morning of this Saturday, they found a “narco banner” on the pedestrian bridge of Conalep, on Avenue Simbolos Patrios, same banner that they tried to photographed when they were arrested by officers of State Police. The reporters identified themselves with the state police, and despite that, they were arrested, what happened @SrioSegOax where is the respect? U.S. officials on Wednesday said their intelligence indicates that the Sinaloa and Juárez drug-trafficking organizations are still active in the Juárez region, and that a recent spike in drug violence there can be attributed to cartel disputes. Joseph Arabit, special agent in charge of the Drug Enforcement Administration in El Paso, said the violence stems from "fracturing within the Sinaloa cartel and continued fighting between the cartels." Army Colonel, Marisa Tanner, intelligence director for Joint Task Force North at Fort Bliss, said rogue elements of cartels that break away from the main groups contribute to violence. Arabit and Tanner were among panelists Wednesday at the International Association for Intelligence Education hosted this week by the University of Texas at El Paso. 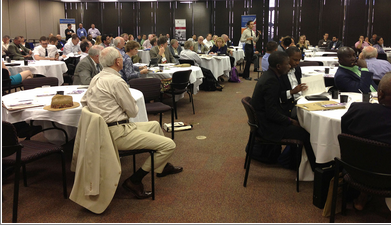 The conference brings together intelligence educators and trainers from around the world. They were joined for a discussion on border security by Ian Brownlee, U.S. consul in Juárez; Mark Morgan, FBI special agent in charge in El Paso; and Edward Regula, chief of the Border Intelligence Fusion Section at the El Paso Intelligence Center. Although elements of both drug cartels operate in the Juárez region, the experts said, intelligence indicates that Joaquin "Chapo" Guzman's organization, of Sinaloa, is the dominant group. 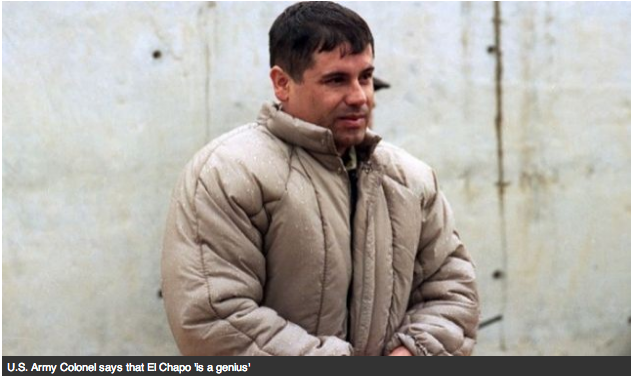 "Chapo Guzman is expanding every day. He's a genius," Tanner said. He added that Guzman sees the U.S. as a stagnant market and is also franchising cartel operations to Europe, using Africa as a route.Tanner, who believes hitting the cartels in their wallets is the most effective way to dismantle them, also said the cartels probably conduct their own conferences to review such topics as transfers of technology and skill sets. "Border violence has been a challenge for us over the past five to six years," said Arabit, who noted that annual violence peaked in Juárez with 3,600 homicides in 2010, compared with 180 to date this year. "Our number one priority is keeping the community safe and ensuring the horrific violence (south of the border) does not spill over." Last month at Juárez City Hall, El Paso Mayor John Cook encouraged El Pasoans to visit the city. Since then, Juárez experienced several high-impact homicides, including a massacre that killed four people at the Montana eatery on Avenida Gomez Morin. EL PASO – The word “partnership” was frequently used at the round table discussion of “Security Along the U.S.-Mexico Border” to explain what it takes to counter terrorism. This event was one of the many sessions of the 9th annual International Association For Intelligence Education (IAFIE) conference at the University of Texas at El Paso Wednesday. Five government officials of various agencies, such as the Drug Enforcement Administration and the Federal Bureau of Investigation (FBI) spoke in the panel. UTEP’s Vice-Provost Michael Smith began the session as the moderator. “This is a topic of keen interest obviously in El Paso and along the border region,” Smith said. One government official mentioned a few obstacles to securing the U.S.-Mexico border. Arabit said that there’s something to be glad about in our area. Arabit also praised the benefits of partnering up with other organizations. Army Col. Marisa Tanner, intelligence director for Joint Task Force North at Fort Bliss, said that the 19,000 miles of the U.S.-Mexico border is just a fraction of the scope of the drug war. Tanner added that working with other organizations is key. Inside Mexico's Drugwar: Who are the 70k Dead? Alleged Tijuana Cartel member arrested in Peru.